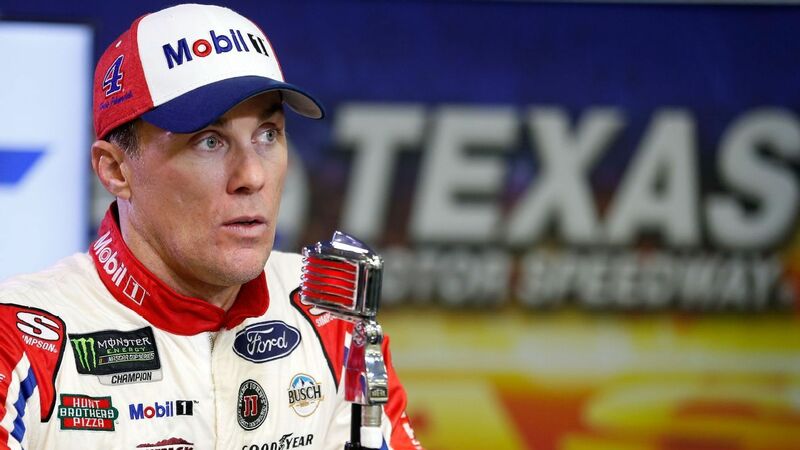 Kevin Harvick is no longer locked into a NASCAR Cup Series playoff spot, as his race-winning car from Sunday at Texas Motor Speedway was found to have a manufactured spoiler designed to offset to the right, evading NASCAR rules and helping the car aerodynamically. NASCAR slammed the Stewart-Haas Racing team with penalties, including not allowing Harvick to use the win for the automatic berth to be among the four drivers who will vie for the Cup championship Nov. 18 at Homestead-Miami Speedway. Harvick was docked 40 points, crew chief Rodney Childers and car chief Robert Smith were each suspended for the last two races of the season, and Childers was fined $75,000. With Kevin Harvick losing his assured championship berth due to penalty, here are the updated scenarios for Phoenix. Kevin Harvick earned a shot at another NASCAR Cup championship, rocketing past pole sitter Ryan Blaney in overtime Sunday to win at Texas. At age 42, the driver of the No. 4 Ford already has three more wins than he’s had in any other season in his career. “It is not our desire to issue any penalties but will do so when necessary to ensure each race and championship is contested on a level playing field,” NASCAR senior vice president of competition Scott Miller said. The penalty leaves Harvick clinging to the final playoff spot available on points, as he sits three points ahead of Kurt Busch and 17 ahead of Chase Elliott going into the elimination race Sunday at ISM Raceway in Phoenix. SHR will not appeal the penalty. Former Cup crew chief Tony Gibson will replace Childers. Miller, speaking to reporters Wednesday night, said NASCAR believes SHR manufactured the spoiler instead of using the spoiler from the approved vendor. He said it would not have mattered if an approved spoiler was altered or whether the spoiler didn’t come to the vendor — the penalty is the same. Miller said while the spoiler was the correct height, it was offset to the right between 0.2 and 0.3 inches. He said that would help the car aerodynamically. There was no question the part was designed to violate the rules, he said. “It’s as black and white as it gets,” Miller said. Starting at Phoenix this weekend, NASCAR will remove the spoilers from the cars to make sure they are legal. It previously would just measure the height and length, believing because it is a spec part, it should be legal. Miller said an official noticed Sunday in the postrace inspection that the SHR spoiler seemed suspicious. Joey Logano is the only driver locked into the final four. Kyle Busch (28 points ahead of his brother, Kurt) and Martin Truex Jr. (25 points ahead) have cushions that should allow them to advance if they run reasonably well at Phoenix. Phoenix is one of Harvick’s best tracks. He has nine Cup wins there, including the most recent race in March. He has won seven times in his past 12 starts — and finished outside the top 5 only twice in those starts — at the 1-mile flat track. While the Phoenix track has remained the same, the race on Sunday will be the first with a relocated start-finish line, now positioned in the dogleg portion of the former Turn 2. NASCAR on Wednesday also penalized Ryan Blaney, who finished second at Texas, and Erik Jones, who finished fourth. They were docked 20 points as well as having their car chiefs suspended for two races and their crew chiefs fined $50,000. Blaney had a door front crush panel violation, as the filler panels didn’t remain permanently attached, and Jones had a package tray violation. Both drivers were eliminated in earlier rounds of the playoffs.